Sonos is the king of wireless speakers, and everyone knows it. Of course, it costs a pretty penny to go with the best. That’s why discounts on Sonos speakers are always noteworthy and right now you have a chance to save big. 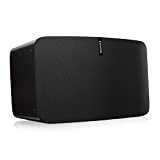 Just head over to Amazon where you’ll find a $60 discount on the Sonos PLAY:1 Compact Wireless Smart Speaker ($1o off up front, and another $50 off using the promo code SONOSPLAY1) and a hefty $100 discount on the Sonos PLAY:5 Ultimate Wireless Smart Speaker using the promo code SONOSPLAY5. There deals are only good until October 10 or while supplies last. Play:1 is our compact, surprisingly powerful speaker. It’s a perfect fit for bookshelves, counters, and other snug places. So now you can enjoy great-sounding music anywhere. Connect your [Play:1] to any Amazon Echo or Alexa-enabled device, then just ask for the music you love. Wirelessly Stream all your favorite music services like Prime Music Unlimited, Pandora, Apple Music, and Spotify.